Did you know teriyaki sauce is made of only 3 ingredients? You could always add more, like sesame seeds, a little grated ginger and garlic. But plain and simple, teriyaki sauce is equal parts sugar, sweet cooking wine (mirin) and soy sauce. 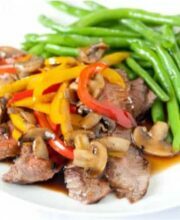 In addition to the sauce, you will need steak of your choice, button mushrooms and a selection of bell peppers. Mirin is Japanese sweet rice wine and contains sugar mixed with rice wine. You can find mirin in Asian grocery stores and I’ve seen it sold in most regular grocery stores in the “Asian” or ethnic section. I’m working with Mitsukan to show off how simple teriyaki sauce is to make using their mirin. 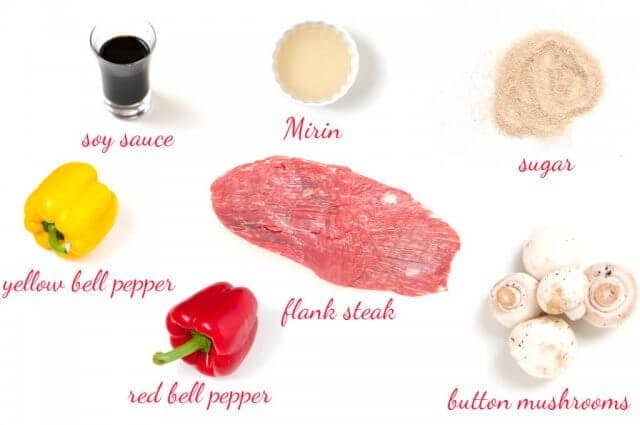 Mirin is used in many of your favorite Japanese dishes (like teriyaki! 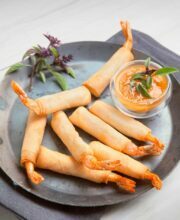 ), tempura sauce, seafood dishes and sukiyaki, adding that slightly sweet flavor to the dish. It’s gluten-free. 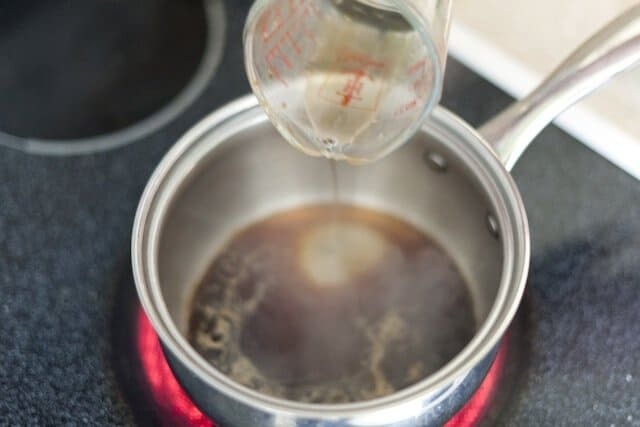 To make the Teriyaki sauce, just bring all three ingredients to a simmer until all the sugar dissolves, about 1 minute. That’s it! In a small saucepan, over low heat, add the soy sauce. Next, add the same amount of mirin. 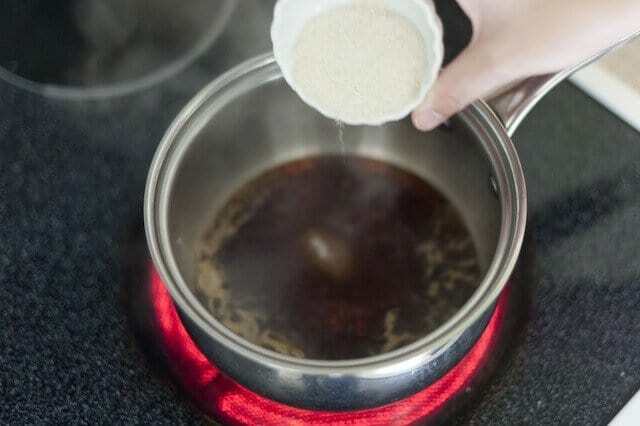 Then, add the sugar. Simmer the sauce for a few minutes and you’re done! 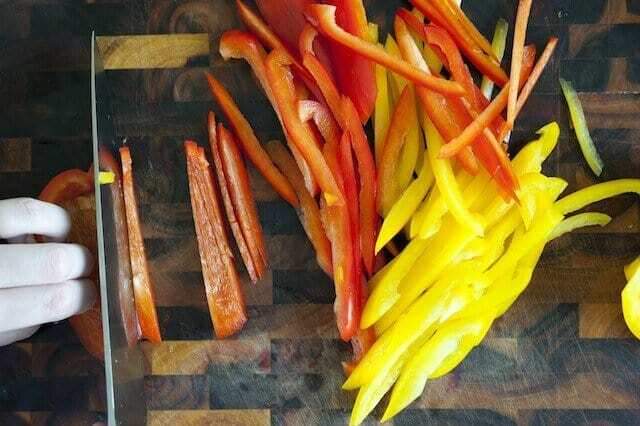 First, prepare the peppers by slicing into thin long strips. 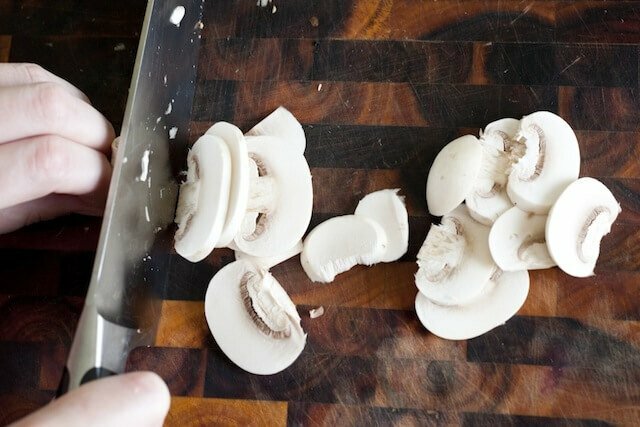 Next, slice the button mushrooms. 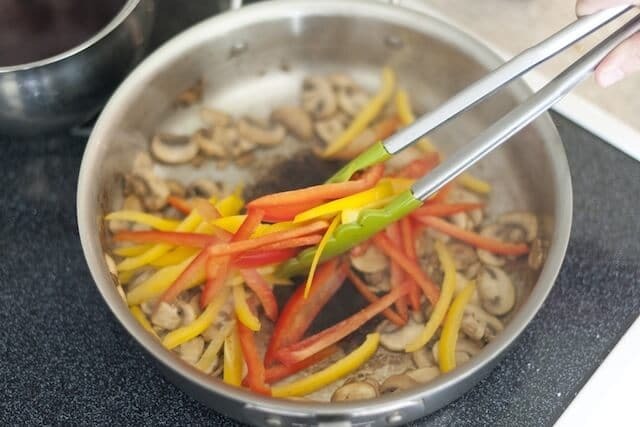 Heat a large pan to medium-high heat, add a tablespoon or so of cooking oil and sear the steak on both sides then remove from pan, while you sauté the mushrooms and peppers. Add a little more cooking oil, then mushrooms and cook for a few minutes. Next, add the peppers and cook for about two minutes. 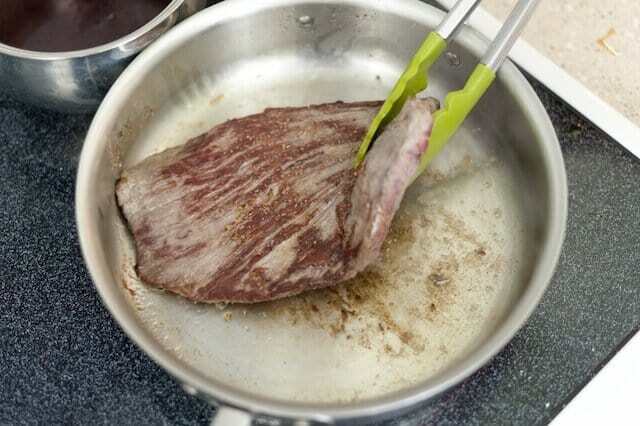 Place the steak back into the pan. Then, pour the sauce over the steak, mushrooms and peppers. Cover and lower the heat until preferred doneness. To serve, slice the steak against the grain and top with peppers, mushrooms and extra teriyaki sauce. 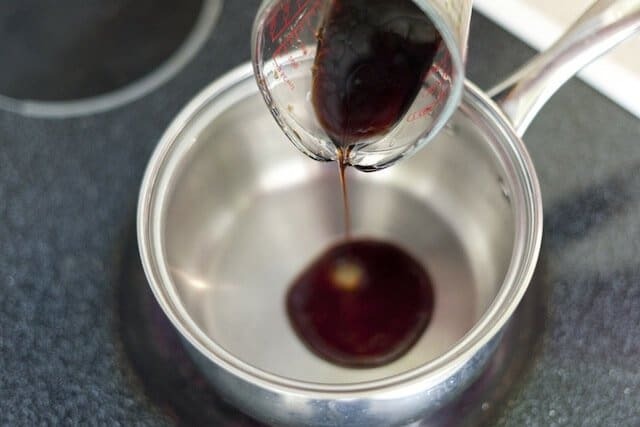 1) To make the teriyaki sauce, whisk all the sauce ingredients in a small sauce pan and simmer on low for 3 minutes, until the sauce has thickened slightly then remove from heat. 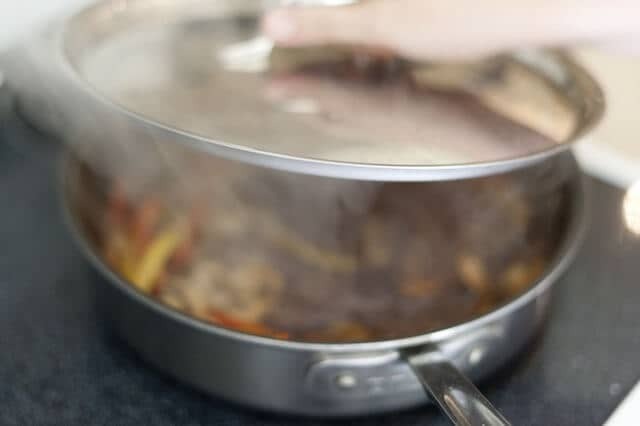 2) Add one tablespoon of the cooking oil to a pan over medium-high. Season steak with salt and pepper then sear the steak 2 minutes on each side and remove from pan. 3) Add the remaining 1/2 tablespoon of cooking oil. 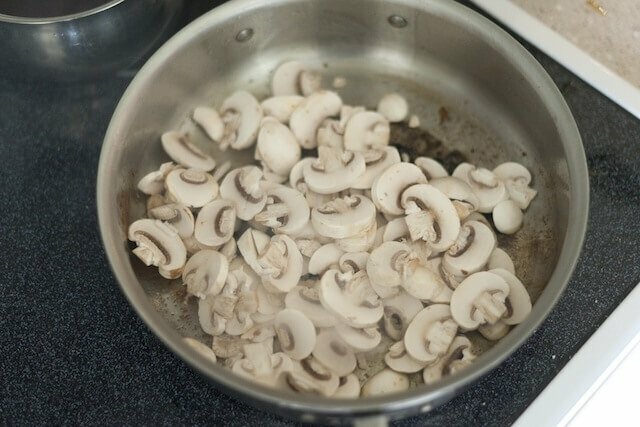 Add the mushrooms and sauté until mushrooms are lightly browned, 2 minutes, and then add the peppers and cook until crisp tender, another 2 minutes. 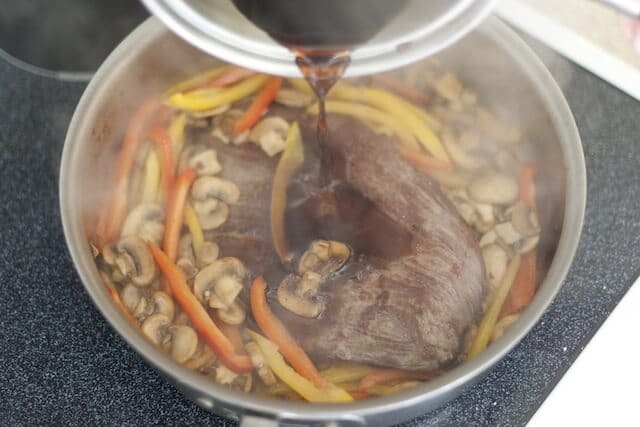 4) Place the steak back into the pan, reduce heat to low and add the teriyaki sauce, let simmer for 1 minute. 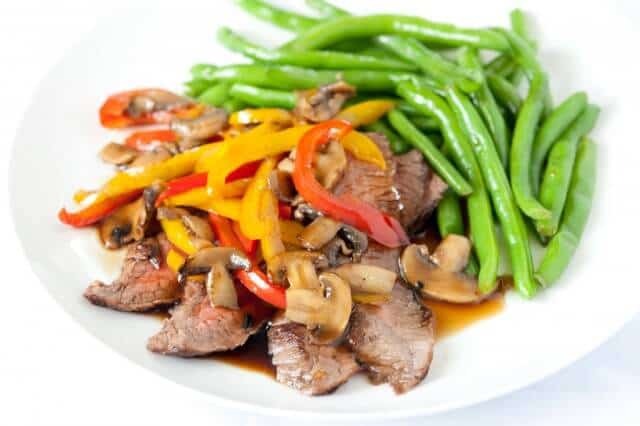 Serve the teriyaki sauce, mushrooms and peppers on top of the steak. This is a really easy recipe guide on how to make a great steak! Thank you for this information as I thought you only used the sauce straight from the bottle, phew disaster diverted, I’m sure now this is going to be delish. Hi Jaden — Love, love, LOVE this recipe, which has become a favorite of ours, especially during the summer grilling season. Question for you though: What’s the shelf life of homemade Teriyaki Sauce? 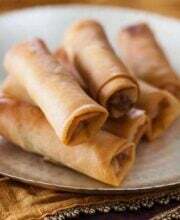 We love to make a big batch and keep some in the fridge. I’m just wondering how long it will keep? Thanks so much for the great recipes and cookbooks. I’m a huge fan! This is a winner! I have all the ingredients in my ref and I have company coming this weekend ~ so it’s perfect. Thanks for sharing the recipe for steak teriyaki, Jaden! This is great! I just made this for dinner tonight! I work long hours and I am always on the lookout for dishes that require minimal pots and pans, taste great, and cook quickly!! This recipe is a score!! i love teriyaki..if you combine teriyaki sauce with salmon or chicken, i think it so delicious..
Teriyaki sauce is simply delicious. It’s one of my favorite sauces. It goes well with chicken, salmon, beef, just almost everything. Yummy…this makes me crave and eat meat again. .. I made this last night and it was a hit! It was sooo easy 🙂 I also didn’t realize that teriyaki sauce could have only three ingredients and taste so good. Thank you. Hi Jaden! Love this recipe. I would have to leave the mushrooms out but maybe I could sub in asparagus or something. Love teriyaki sauce. I also really adore tamari. Think it’s my fave so far. Have this one bookmarked to try. Thanks for sharing. How do I make my own Gluten Free Miso from scratch? Very few people make miso from scratch. It’s fermented soy beans. You’re better off buying gluten-free miso. Just do a search. Wow! This is absolutely divine! I can just hear the steak sizzle and smell the aroma of the sweet teriyaki as I read the recipe and stare at your photos. Teriyaki in any form is always a favorite at our home. I will definitely try this one right away. Thanks for sharing. I love your terrific site, Jaden! Cheers! I am so excited to have a teriyaki recipe. My son has to be GF and while I can find GF soy sauce, I have never found a GF teriyaki sauce. Thanks! This looks easy and delicious! Thanks for sharing! I did not know what teriyaki sauce was made of until this very moment. Thanks! I do know that I love it, and this recipe sounds scrumptious. I have always wanted to make my own teriyaki, but for some reason never have. Thanks for inspiring me to try it, Jaden! It looks delicious! I’ve been a bit of a mirin ho lately, sneaking it into a lot of sauces. 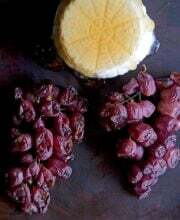 Mirin and agave have been my favorite sweet flavors this year. I wanted to jump into the computer and eat this. I’m definitely making this! Thank you. A certain name brand used to make this garlic teriyaki sauce that I loved and bought all the time. I haven’t been able to find it for several years, but this makes me thing I can just make my own. Yummm… This looks so delicious…. I love the way you show ingredients, neat and clean. Thanks for the link love. Love Mizkan mirin! That looks so good. I don’t eat much red meat, but I think it would work with chicken. How long will a bottle of mirin keep once it has been opened? how long is “done”? does’nt say in recipe. Now THIS is gorgeous. I could stick my face in that steak steam for a nice facial steam. Steak facial steam. I like this! So simple, I will definitely be trying this!